After four hard fought basketball games over two nights, the 2008 Tournament had a familiar ending. The Norristown Eagles won their fifth consecutive championship defeating Germantown Academy 64-54. Long time Norristown hoop fans may remember the Eagles’ 8 consecutive championships from 1992 through 1999. The excitement and fan interest has retruned to the Norristown gymnasium. 2008 tourney MVP Khalif Wyatt with Triangle Club President Charles Mandracchia. The 2008 title game saw Norristown holding a slim 45-41 lead over Germantown Academy entering the 4th period. But acting head coach Julius Mack had the Eagles playing pressure defense against the high scoring Patriot’s sharpshooters all night. 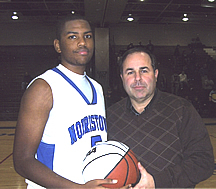 Norristown outscored Germantown 19-13 in the final frame behind the strong performance of 6’4″ all-state Khalif Wyatt. Two time tournament MVP Wyatt scored a game high 27 points, including four 3 point field goals. Senior teamate James Ramsey also made four 3 pointers, scoring 16 points. 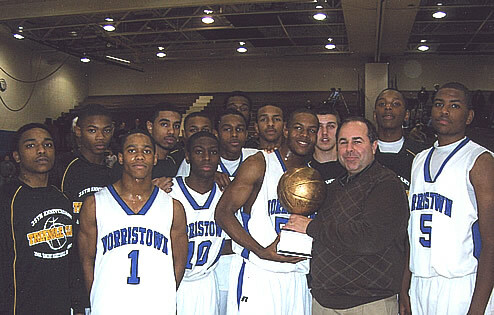 Norristown’s total team effort paid huge dividends throughout the 2008-09 campaign as Coach Mike Evans Eagles would later claim the District 1 championship. Coach Jim Fenerty’s Germantown Academy runnerup squad was paced by junior guard Cameron Ayers 20 points and 6’6″ center Jeff Holton’s 16. Both players were a perfect 6 for 6 from the free throw line. Senior guard Jimmy Fenerty chipped in with 9 markers. The Patriot’s would go on to complete another fine season by winning their 3rd consecutive Inter-Ac championship. In the 2008 consolation game District 1 powerhouse Lower Merion got all they could handle before staging a dramatic comeback and edging the Souderton Indians by a score of 69-67. Coach Perrry Engard’s Indians were winning 55-48 after 3 periods. Greg Downer’s Aces came on with a flurry of 3 pointers and outscored Souderton 21-12 in the final stanza. In this game the big scorers came out to play. 3 point shots were flowing like rainbows. Lower Merion’s star player 6’5″ Greg Robbins tossed in 30 points. Teamate Alon Seltzer hit five 3 pointers and scored 27 points. Souderton’s Jim Connolly scorched the nets for 28 points. With so many top high school players in this years tournament, it appeared that (Norristown grad) Ken Coull’s 32 point individual scoring record (set back in 1987) was in jeopardy. However, it will stand for a least another year.